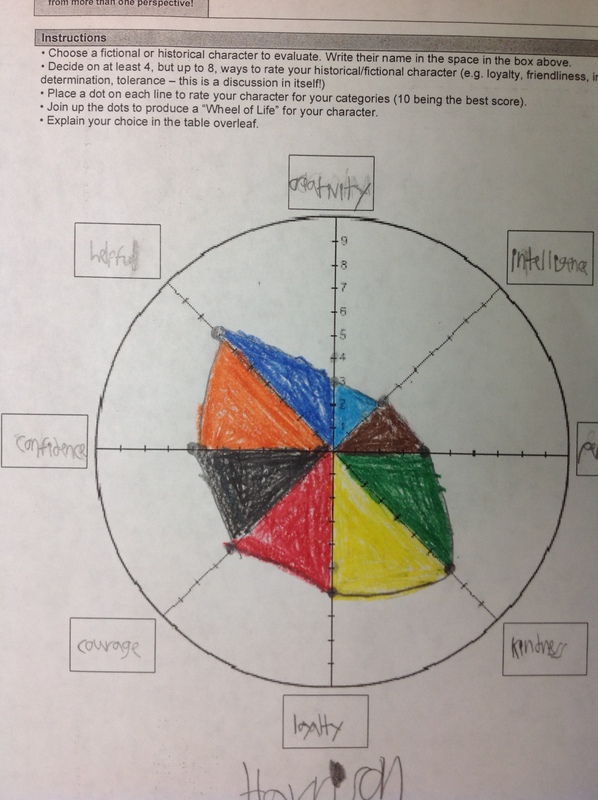 On Monday, I wrote about Tarr’s Toolbox and one of the resources you can find there, the “Wheel of Life.” My 4th graders have been reading Tuck Everlasting (R.I.P. Natalie Babbitt, who died October, 2016), which uses wheels and circles for symbolism throughout the novel. 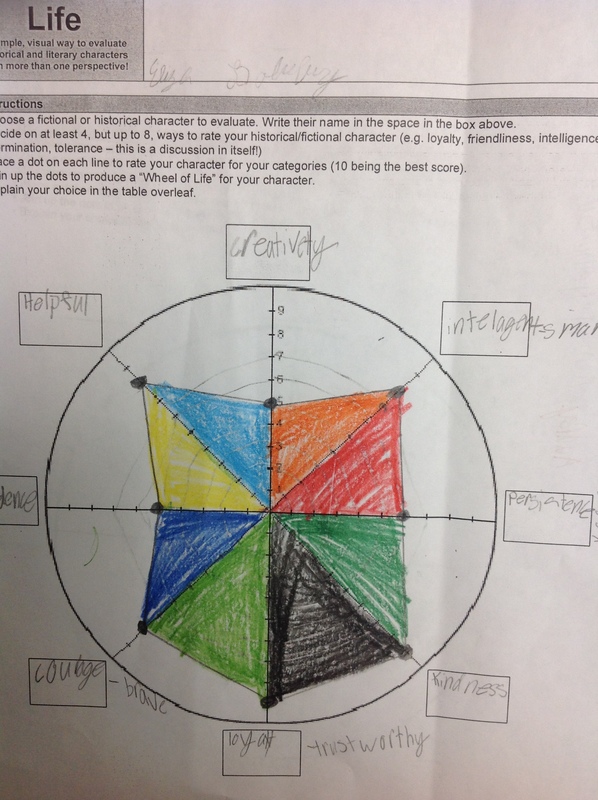 They have also been discussing the attributes of the main characters, so I thought the “Wheel of Life” would be a fitting activity to try with them. 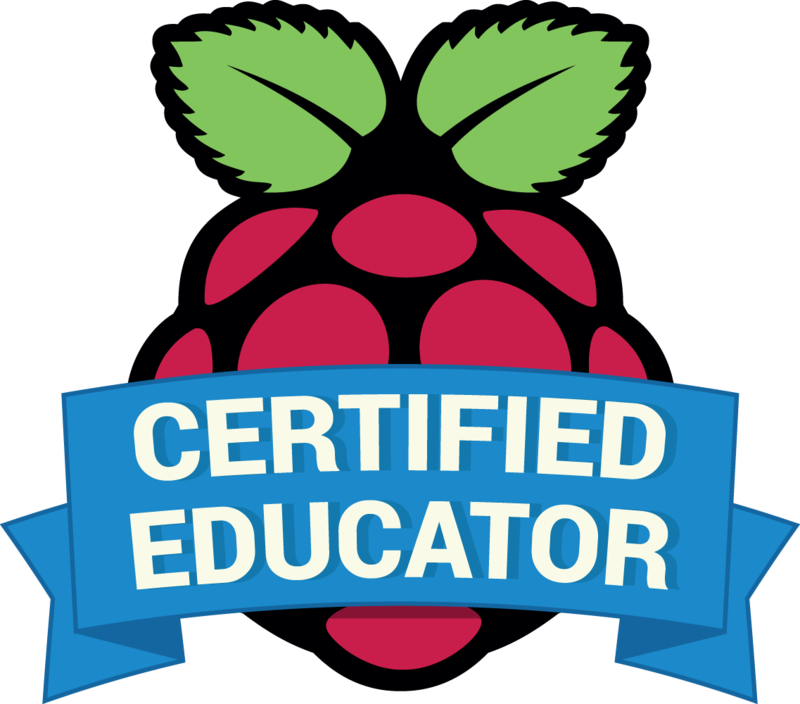 There are many ways this activity can be done, and Russel Tarr has great suggestions on his blog. 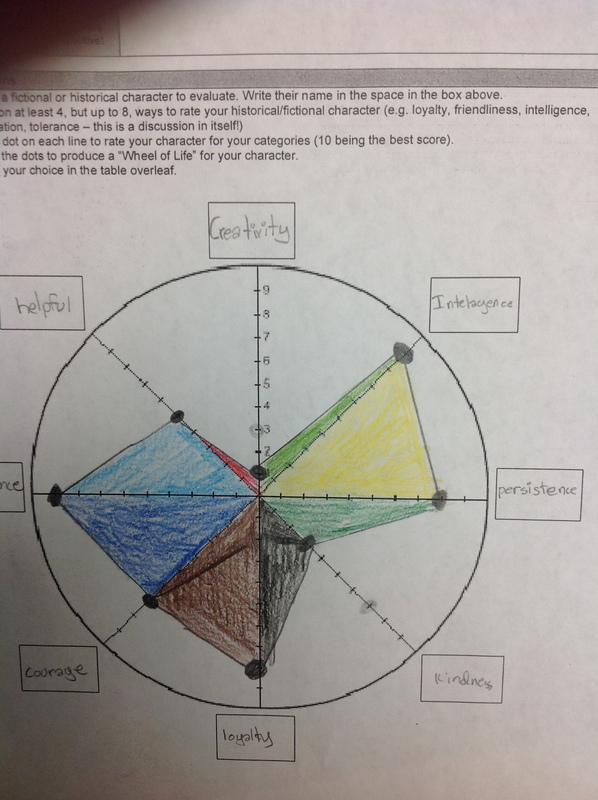 Because it was their first time doing this, I gave the students character traits to copy on their wheel, and deliberately asked them to put them in the same spots on their wheels. Then I “secretly” assigned each student a character to plot the points for, and told them to hold off on writing the name of the character at the top. I deliberately assigned the same characters to several students so we could compare their responses later. 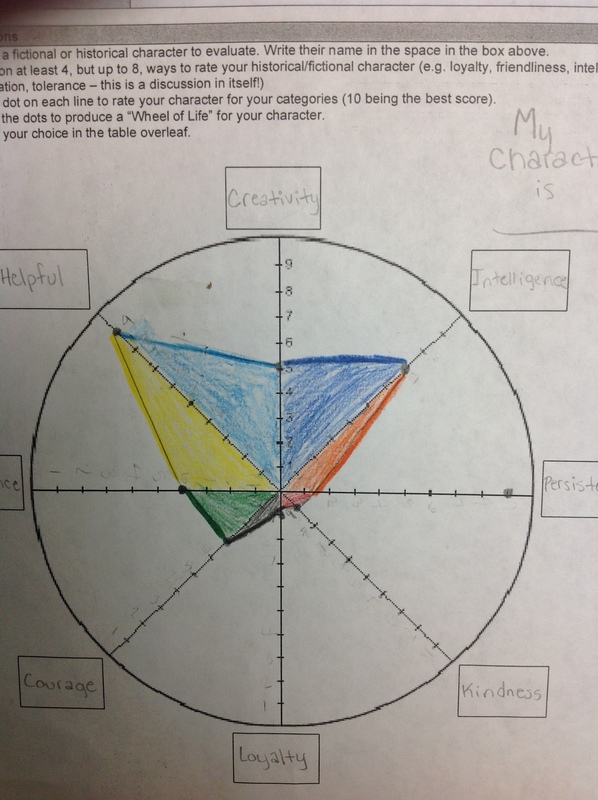 When everyone was done, we went around the room and tried to guess the character by how each student’s Wheel of Life looked. It was almost eerie how easy it was – until we got to one student’s graph. After several wrong guesses from her classmates, she finally had to reveal her character’s name. Jaws dropped and there was immediately the beginning of a debate. However, an unexpected interruption happened before we could discuss the varied opinions, making us table our questions until next week’s class. 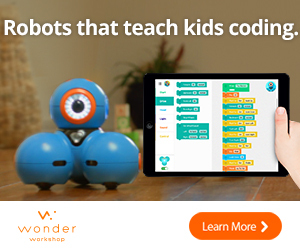 The conversation associated with this activity is so deep and rich. I can’t wait to continue it next week. I also see some other extensions that we can do, such as creating graphs for our own personalities to compare and contrast with the characters in the story. The experience with this lesson reminded me of the great learning that happened last year when we used Hexagonal Learning to examine our literature. 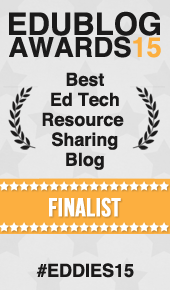 If you are looking to integrate higher levels of Bloom’s into your lessons, I highly recommend both of these activities.